Following a daily routine of chopping and cooking in the same kitchen, seasons after season can become boring. Remodeling the kitchen altogether is an expensive task. It also upsets the kitchen dynamics, as it requires a chunk of your expensive time. Simply changing the cabinets can uplift the ambiance of the kitchen. Such a makeover is not only time-saving, it also banks away your hard-earned savings. However, the job may become a total mess if you have not done your homework regarding cabinet renovations. Here are some guidelines to hassle-free cabinet job in your kitchen. Analyze the required changes to your kitchen cabinets. If they have grown old and shabby while serving their function, a total replacement needs to be done. However, with sound cabinets with sturdy structure, re-facing techniques can spruce up the kitchen look. With a limited budget, you can go for used kitchen cabinets. Changing the exterior of the cabinets with new paint, textures, or trims can bring a much-needed renovation. You will be surprised at the change new cabinet fixtures can bring about. Adding crown molds across the top of the cabinets also freshens up the look. Adding feet to your cabinets or simply removing the doors of the cabinets with an unbolt look delivers a chic impression to the kitchen. The kitchen is the hub of activity even with a minimal number of family members. Admit it or not, it takes years before a kitchen gets a renovation done. Nevertheless, kitchen space is auspicious enough to cater to big change with minimal alterations and carry it until the next overhaul. So smart analysis and clever choices help you get the job done with ease and win-win solution. Once the specifics about kitchen cabinets are decided, allocating a clear budget becomes convenient. Though kitchen cabinets cost an approximate of one-third of the total kitchen expense the result is worthy of this cost. Plus, you will have a new look for as long as you enjoy it. If you opt for used cabinets or decide to reface the kitchen cabinets, there is an additional cut back on the total cost. There is not much you can do to the primary architectural blueprint of your kitchen if you are going for minimal touch-ups to the cabinets. However, changing the cabinets altogether is tagged with a choice to change the kitchen style as a whole. Kitchen cabinet showroom NJ provides unlimited choices in different styles. So whether you prefer the rustic, contemporary, modern, or bohemian look, kitchen cabinets in corresponding styles deliver the specific parallels. Take a timeless approach with traditional style cabinets, paint them or insert glass, they do not go out of style. Love the clean sleek design of contemporary style; update your cabinets with a minimalist approach. Match and contrast cabinets to get a modern look or choose dark, rich and bold characteristics of transitional style cabinets. Three basic cabinet types for kitchen cabinets are stock, semi-custom, and custom. The difference lies in the manufacturing method. The quality of the cabinets remains the same, however, with production variations; the cost varies with each type. Stock, as the name implies, are made in bulk in factories. The advantages with this type are quick delivery and affordability with the deliverance of exact quality of items as displayed. However, due to bulk manufacturing, the cabinets are displayed in a limited choice of color, wood material, shape etc. 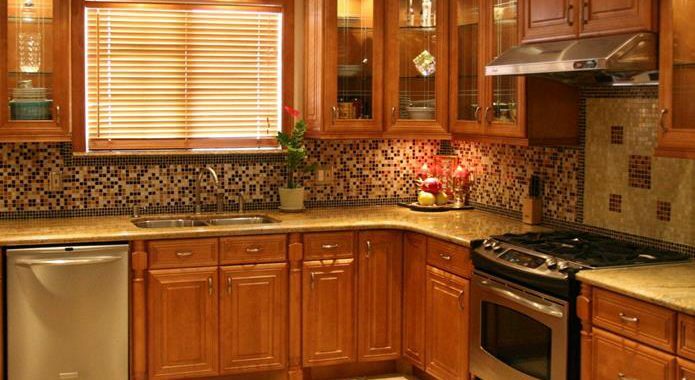 Custom kitchen cabinets are customized according to your requirements. You can enjoy the liberty of experimentation with additional details and leisure features according to your budget. These can be made by an expert within your premises or made in a factory. The overall cost of the cabinets follows the labor put in. the cabinets also take time to be built ranging from few weeks to months. Semi-custom cabinets merge the advantages of stock and custom types. They are built in bulk amount with simple textures. More details are added according to the customers’ preferences. One can always resize these cabinets or change the depth according to the dimensions of your kitchen. This allows you to cut back on the total cost with an input of your personal details. When the basic groundwork is done, it is time to start some practical work. If you are confident enough to take the measurements like a pro, you can venture it yourself. Knowing the weak spots of your kitchen cabinets gives you an edge to make the required amendments in the future design. You can always call upon an expert to take the dimensions. You can guide the sales representative in a better way to highlight your preferred details. Adding functionality to your kitchen cabinets is practical in semi-custom and custom designs. There are infinite options to add to the storage space and improvising around the kitchen via alterations to the cabinets. addition of pull out shelves, a wine rack, a Lazy Susan, vertical shelves, cookie garages, pull out bins add versatility to the kitchen cabinets. Changing the length of cabinets to accommodate narrow corners of your kitchen make such difficult angles accessible. Whatever choice you make for the kitchen cabinets, there should be no compromise on the quality of the cabinets. It adds to your savings in the long run eventually. A kitchen cabinet should be sturdy in design and solid in character. Attention to frames, doors, fixtures, and back of the cabinets not only adds to the drawing but also add to the cabinet life. A kitchen is a place of your home with minimal decorations. However, matching the kitchen accessories and furniture with the cabinets highlights small details. Selecting a matching finish for the cabinet doors with the dining furniture or upholstery can harmonize the entire look of the living abode. Jonathan is freelance writer and has five years of experience in writing topics like, interior designing, kitchen cabinets, kitchen décor, custom cabinets and Kitchen cabinet store NJ.